Alan Dritenbas and Mike Malone, co-founders of Walking Tree Brewery, both followed their passion for brewing away from previous positions into the world of craft-brewing entrepreneurship. "Any entrepreneur needs to have a passion for what they're doing or they won't give it what it takes to be successful," said Dritenbas. "We have a passion for brewing beer and watching people enjoy it. To have the opportunity to start a business that could improve our town and community was really exciting to us. I graduated with a degree in architecture and was working as an architect but the economy was in the tank in 2008 and '09 so I was actively competing in homebrew competitions around the state. I saw that I wanted a more social career." Walking Tree Brewery is an award-winning craft brewery with a 5,000-square-foot tasting room that also distributes throughout the Treasure Coast and Orlando. "We provide a fresh, local, high quality beer to our area and consider our tasting room a hub for community involvement and action," explained Dritenbas. "We focus on traditional beer styles and make beers that are easy to drink," added Malone. "That brings people in here and keeps them here. 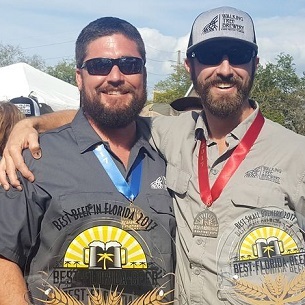 Our Barnacled Manatee Barley Wine Won the Best Beer in Florida out of 811 competitors at the Best Florida Beer Championship. We also won Best Small Brewery because we had more medals for our beers than other breweries our size." In addition, the Indian River Chamber of Commerce recognized the pair as Entrepreneurs of the Year in 2017. Their advice for aspiring entrepreneurs is to be courageous and persistent. "If you really want to get it done, don't fear what you're doing and go for it," said Malone. "You can't quit or give up," said Dritenbas. "If it's your passion and you believe in it the never give up. We pitched to 11 banks and were told no 10 times. We took time off work to pitch to so many investors. You just have to keep pushing."